The Color Red in Oriental Rugs. Color is a powerful representative of ideals and emotions, and the color red has always been one of the most charismatic ones in the world of Oriental rugs. Red invokes happiness, joy, luck, courage, wealth and a vibrant life force. While in some cases, it represents sorrow and calamity, red is also the color of fire, enthusiasm, virility and faith. 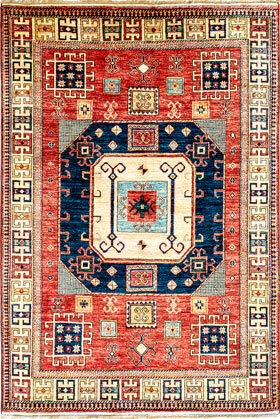 The color red was used in the oldest complete rug we know of: the Pazyryk discovered in 1949 and made over 2,500 years ago. An intricate process was used for obtaining the pigment and making a color-fast dye. It came from a parasitic insect called kermes, the larvae of which grow into fat filled bugs, bursting with a rich, red juice. The insects were collected, put into vinegar and dried, leaving a beautiful red powder dye. Even today the Pazyryk rug, on display at the Hermitage in St. Petersburg, still radiates with deep vibrant reds after all these centuries. Through the course of history, the demand for red dye increased as the color became a symbol for political, economic and spiritual significance in different cultures. In 1519, when Cortez invaded the Aztec territory in Mexico, he came upon fabulous colors of red in clothing, pottery and art. He found that they, too, used a type of kermes, called the cochineal, used for carmine red. The brilliant red comes from the carminic acid in the body of the female cochineal larvae. The Mexicans had a tremendous gift for cultivating the insect and exported the dye extensively in order to satisfy Europe’s, and the European church’s, increasing desire for the color. At the peak of the trade, Mexico was exporting half a million kilos per year. By the end of the European Renaissance, the color red was so widely used for textiles that Mexico could not keep up with the demand. New sources for red dyes, such as plant pigments, were sought and found, and were utilized in rug weaving production as well. The red colors most frequently seen in natural dyed Oriental rugs are taken from the roots of the Madder plant (rubia tinctorium). The pigment in Madder root is comprised of nineteen different components. What’s unique about the plant is that it reflects not only red, but also blue and yellow. The blue and yellow pull the red into a wide spectrum of hues, softening the red and making it less intense, unlike the harshness of a chemically created red. In Oriental rugs, almost every shade of red can be found; from pale pink, to salmon, to rich rust reds and even into aubergine. The different colors of red depend on the variety of Madder plant that was used, when it was harvested, the dye bath recipe, and what mordants were used. Mordants make the dye adhere to the wool permanently and impact the hue. Although the invention of chemical dyes in the mid 19th century replaced many of these wonderful natural colors for a long time, they re-appeared in the rug world thanks to the work of Harald Böhmer, who reconstructed exactly how vegetable dyes had been constituted and re-introduced them into the rug weaving cultures. Today, although still rare, we can find brilliant and colorfast vegetable dyed reds in specialized productions of new hand-knotted Oriental rugs. At The Magic Carpet, we welcome you to experience the warmth and vibrancy of these natural dyes in our large collection of Cultural Survival rugs, or view them online at www.themagiccarpet.biz. The Magic Carpet will continue our monthly educational articles on the extraordinary art and history embodied by Oriental rugs. In our next article will be exploring the color blue in Oriental rugs. For any questions about Oriental rugs, please contact us at 530-265 9229 or at . We are located at 408 Broad Street(The New York Hotel) in Nevada City.